**I use 0.85mm cord for this earring, if you use 1.00mm or bigger cord, choose bead size carefully to match your cord size. Materials ** for 1 side earring. 1. Waxed cord size 0.85 mm. 1. Fold the first waxed cord 40 cm. to the half, tying larks head knot around circle pendant. you will now get 2 cord 20cm. each to work. 2. 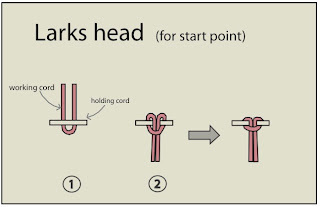 Tying the rest of 15 cords with same larks head knot. you will get 32 cords(20cm. long each ) to work. There will be 2 side, next step work on no knot side. On left side, tie double half hitch to the right, starting from 1-15 cord. On right side, tie double half hitch to the left. 4. 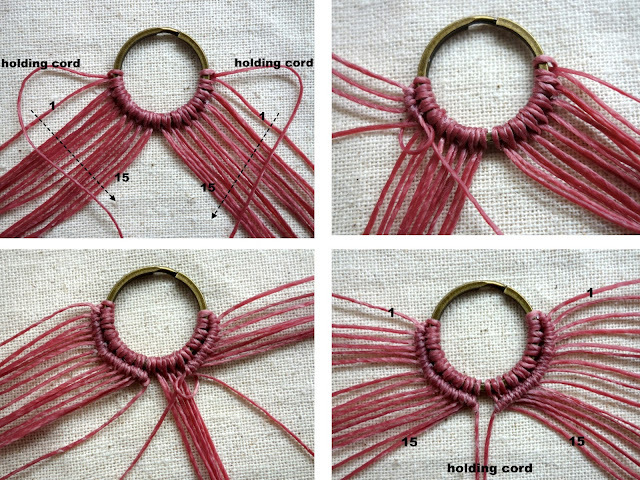 Now the holding cord on the left and right side are in the middle, tie them in the square knot without filler. You just complete the first row of V shape. Tie the same double half hitch bar, but on 2,4,6,8,10,12,14 cord thread 2.4 mm. small beads before Tying. Leave 15 cord for 3.2 mm. big bead. 6. 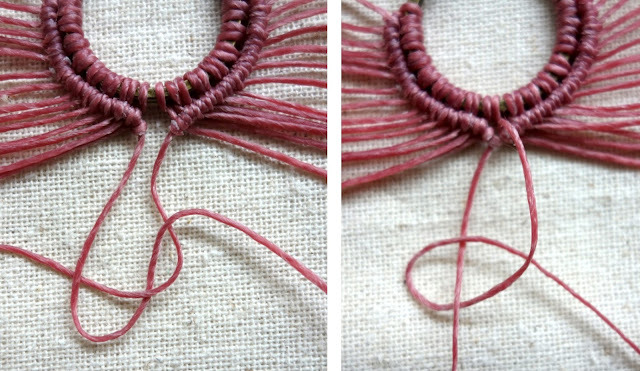 Thread 3.2 big bead into 15 left and right side (2 cord in 1 bead) before tying. Then tie double half hitch bar on left and right side. 7. 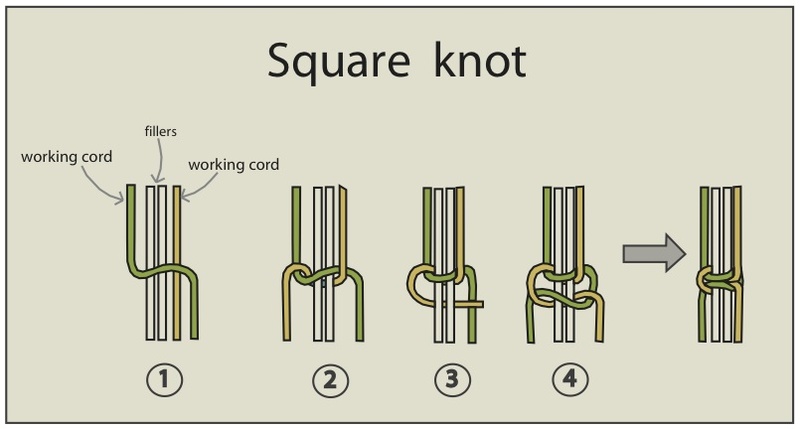 Tie holding cord in the middle with square knot without filler. You just complete the second row of V shape. 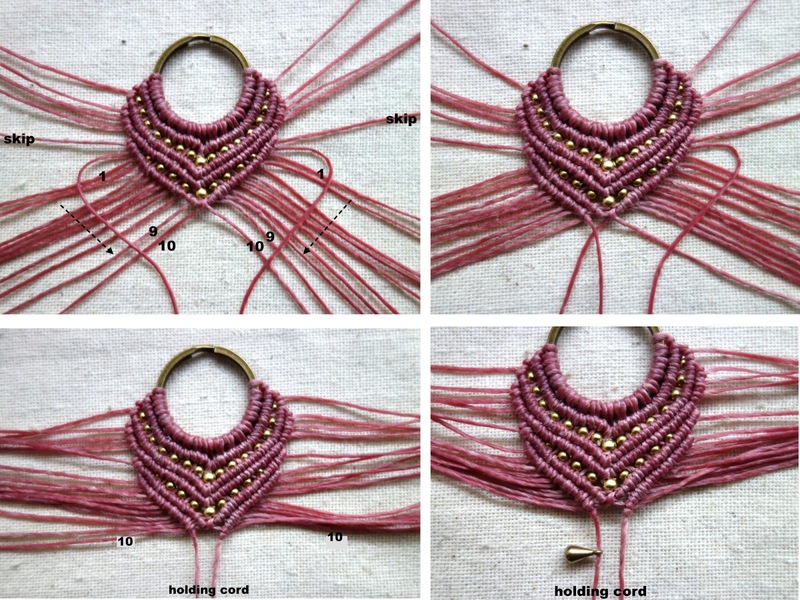 -Skip the most right and left cord of your work. Use cord next to the skip cords to be holding cords. 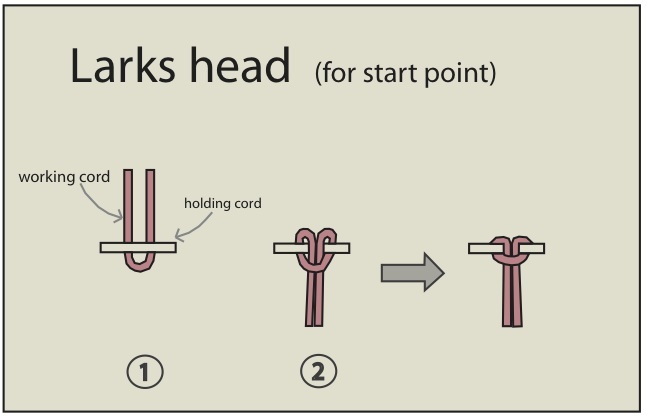 -Tying the same double half hitch bar left and right side, follow by tying the holding cord with square knot with out filler (same as 1th-2th row). 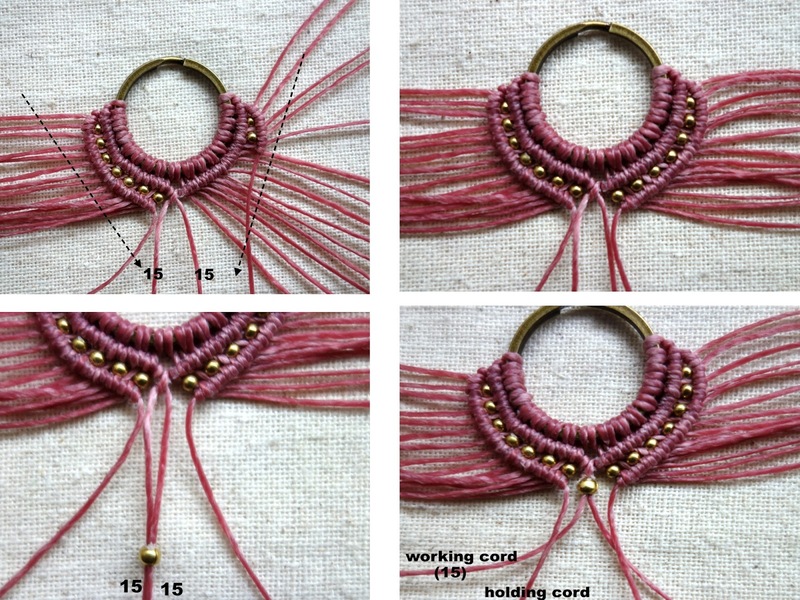 - Skip more 3 cords on each left and right side, keep the next cord as a holding cord of double half hitch bar. 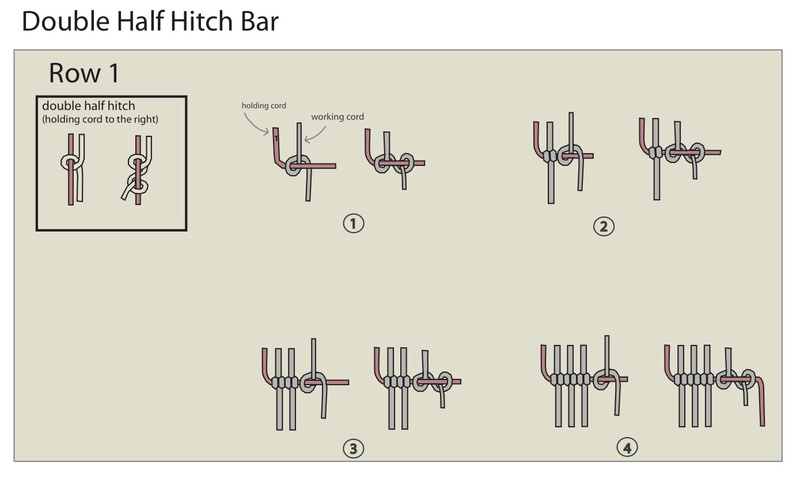 - Start tying double half hitch bar from 1-3 cord. 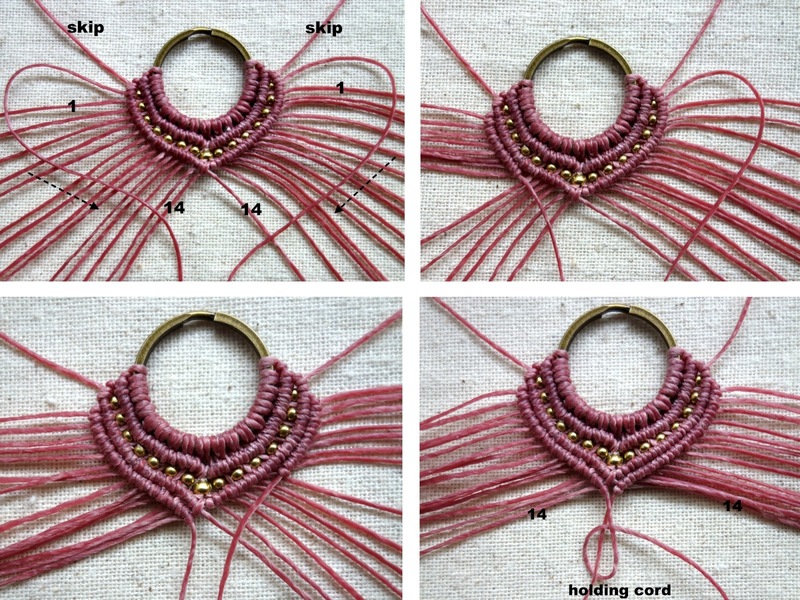 thread 2.4 small brass bead into 4,6,8,10 cords before tying. And Leave 11 cord for 3.2 mm. big bead. 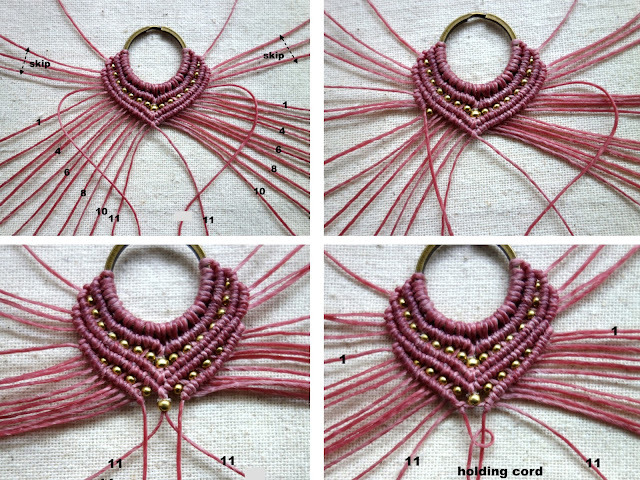 - Thread 3.2 big bead into 11 left and right side (2 cord in 1 bead). Then tie double half hitch bar on left and right side. 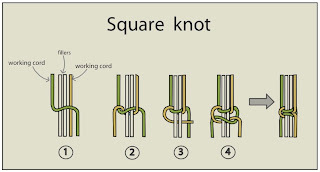 - Tie holding cord in the middle with square knot without filler. - Skip 1 more cord on each left and right side, keep the next cord as a holding cord of double half hitch bar. 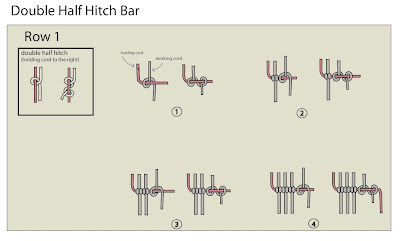 - Start tying double half hitch bar from 1-10 cord. both left and right side. 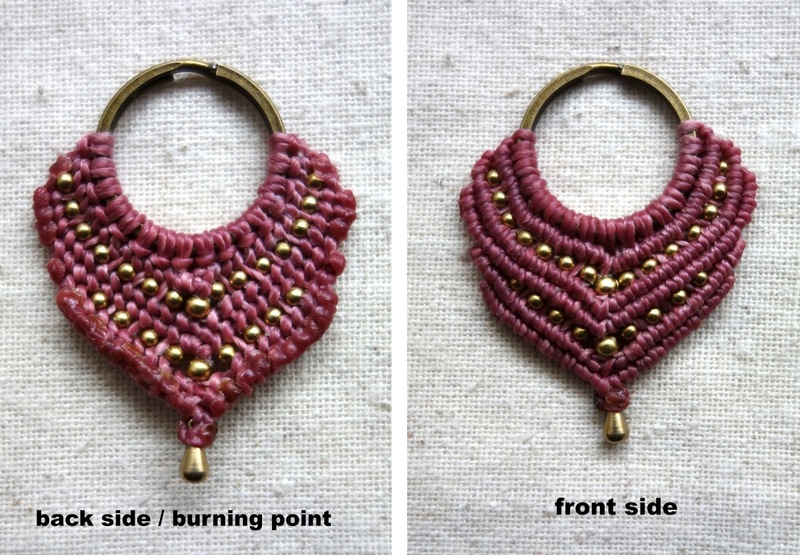 - Thread brass pendant into 1 side of holding cord, then tie holding cord in the middle with square knot without filler. 11. 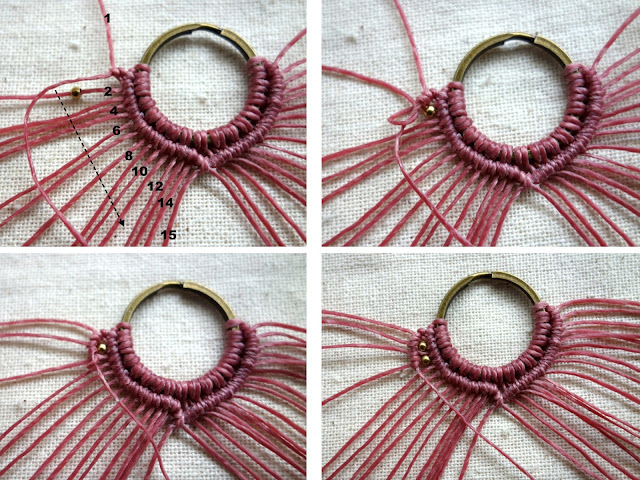 Tie the rest of 2 cords in the middle with square knot, the brass pendant will be their filler. 12. Then cut and burn every cords, keep the burning point at the back side. Thank you for this tutorial ! Its the first time I have understand all the steps ! You did it so easy and cLear! merci ! Wah this is amazing, thanks you so much for sharing, I will send you a picture when I will do some! And do you think HonnVillage is the best shop for buying some macrame strings?